Amazon.com description: Product Description: The general exception clauses of the TRIPS Agreement of the World Trade Organization permit exceptions to copyrights and to the rights conferred by trademarks, industrial designs and patents. These clauses are intended to facilitate access to diverse forms of proprietary knowledge and therefore foster the interdependent pillars of sustainable development: economic progress, realization of human rights and the conservation of the environment. 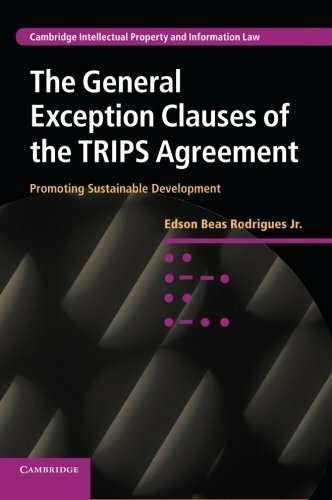 In this book, Edson Beas Rodrigues, Jr argues that the TRIPS Agreement, in its current configuration, does not hinder the establishment of exceptions to intellectual property rights, devised to promote vital socioeconomic interests such as the freedom to carry out creative and inventive activities, freedom of expression, the strengthening of free competition, and increased access to educational materials by underprivileged students and to technical knowledge for humanitarian purposes.